Successful IT Service Management is a different way of thinking, not just a different way of doing. We’ve heard for years about IT silos, and that they’re good and bad…. but mostly bad. “Throwing things over the wall”, “Network is fine, must be an application problem”, “those darn Service Desk folks can’t fix anything”. Been there, done that. As I think through implementing Service Management, I keep coming back to the realization that for a silo’d organization, Service Management is much more than just a different way of doing the same thing. It’s a literal shift in perception. 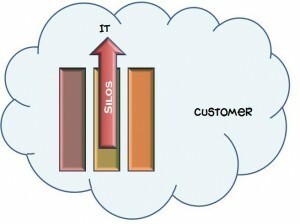 Silo’d organizations think vertically, and Service Management is horizontally oriented. If you try to force horizontal thinking on an organization that is psychologically oriented toward vertical thinking, you have a foundational disconnect. In the silo’d model, staff are primarily concerned with the width of their domain – what all falls under our span of control. Silos are given tremendous autonomy to accomplish their goals and objectives. Friction occurs along the vertical where there may be overlap or lack of clarity of exactly who’s area a particular responsibility or decision falls under. There’s nothing inherently wrong with silos, bad name though they have. Some organizations proudly hail ‘Centers of Expertise’. 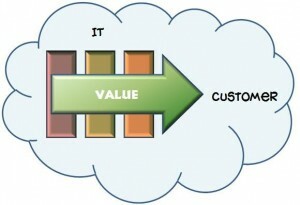 ITIL defines a Function as team or group of people (and their tools) that carry out one or more Process. To those with a strong silo’d background, this sounds like ratification of silos under Service Management. But the output of silos is from the top, as I’ve shown in the figure above. 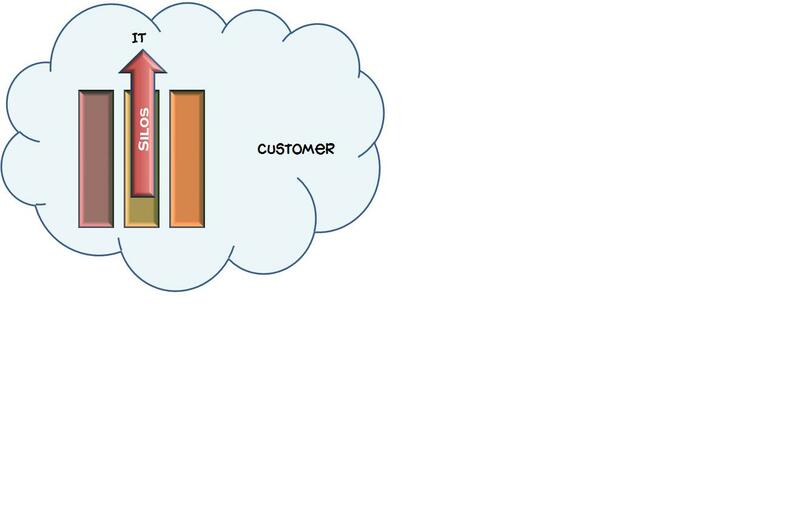 In other words, silos produce value on the vertical – internally focused on IT, and the customer is off by themselves hoping some IT value falls from the sky. OK, maybe a little dramatic, but it makes the point. Grouping similarly-skilled staff together in a unit is almost always beneficial. Increasingly, IT professionals are highly specialized, each with its own lexicon, and unique culture. (“you know how network people are”.) This grouping helps form a healthy subculture where more senior staff mentor and help develop less experienced staff, and collectively they increase their skills in their speciality. Further, technical folks are problem solvers – exactly what they are hired to do … but this leads to process optimization within silos. The highly specialized nature of IT disciplines makes it hard to work across silos, because literally, they don’t understand each others’ worlds. 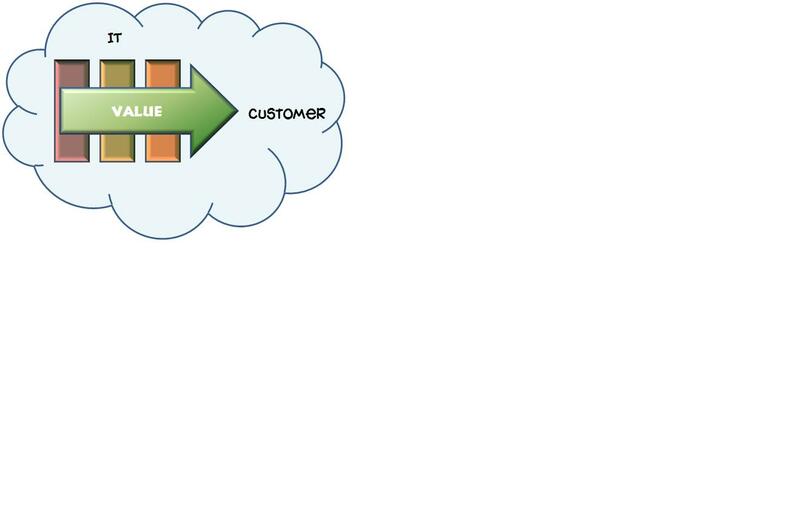 By stark contrast, horizontal thinking is primarily concerned with delivering value to the customer, with responsibilities cutting across the organization. A truly horizontal orientation is focused on how my efforts, in concert with others, contribute to creation of business value along the horizontal. 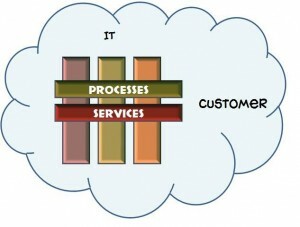 Processes and Services cut across the silos, and are coordinated, by design, by Process and Service Owners and Managers. All (successful) Service Management implementations include identification of process and service owners and managers who will guide their development and implementation. Vertically-oriented organizations may see Service Management as a new tower, and with only marginal interest, because, to them, it’s just another tower who’s domain and span of control needs to be understood. This is where vertical and horizontal start clashing, because service and process owners start behaving as if they own….. things…. That they are “taking over IT”, and “telling us how to do our jobs”. 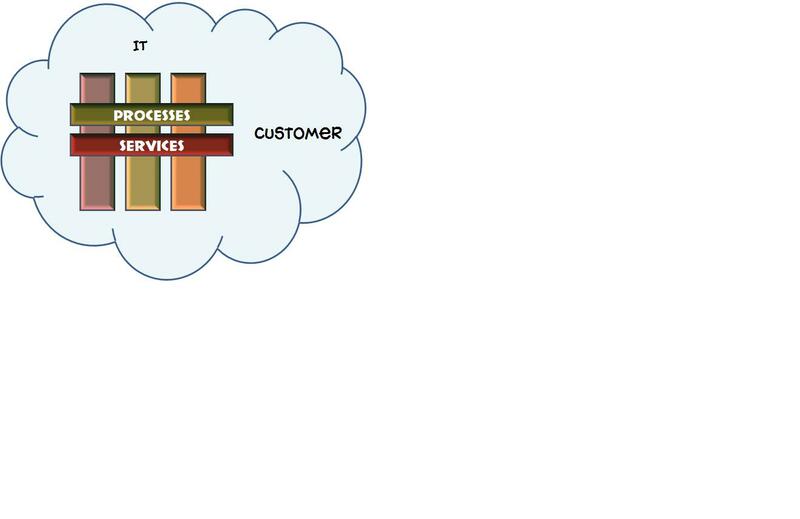 But, as you can see above, horizontal processes and services focus more directly on the customer, which is a key tenant of Service Management. The difference is much more than just another way of seeing things. It’s a frame of reference that requires careful Management of Change for a successful Service Management program. Functionally, the two are exactly 90 degrees out of phase with each other; silos pointing internally to IT, horizontal aiming directly at customers. IT Leadership must start and remain laser-focused on delivering value to customers, establish clear ownership and accountability for horizontal processes (Processes and Services), and help staff align with the organization’s direction (pointing at customers, not IT). Your Service Management program will have very limited long term success if you neglect the Management of Change around vertical versus horizontal thinking. Leadership has the opportunity to cast Service Management as either a “new silo that’s going to really help us do things better” (setting the stage for unnecessary difficulty), or as “the way we deliver ever-increasing value to our customers”.